At the United States Flag Store, we’re proud to offer a variety of American flags for all types of use, including home, workplace, and government. Government flags, however, are designed with slightly different measurements than those manufactured for use in homes, schools, and workplaces. At the United States Flag Store, we have a great selection of American flags for governmental use. These flags are manufactured by Valley Forge, a family owned and operated company whose flags have been historically used in the armed forces and as fallen soldiers and past presidents are laid to rest. The Valley Forge G-Spec Large Cotton 5-foot by 9.6-foot American Flag is an official government sized flag, made in accordance with the U.S. Code Title 4. The flag is 100% made in the United States with the best 2-ply mercerized cotton available. The flag features large embroidered stars and beautifully sewn stripes, and is finished with a heavy canvas heading and solid brass grommets. This size flag is the official American interment flag, and is also known as the burial flag or memorial flag. 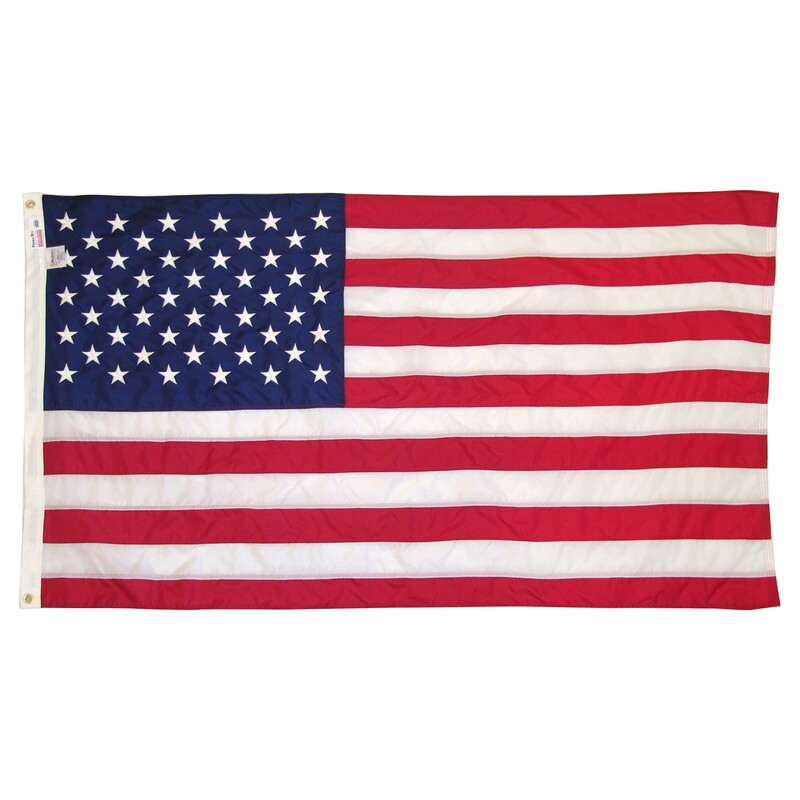 At the United States Flag Store, you can order this flag for only $78.65, a savings of over $126 off the list price. We also have a variety of G-Spec nylon flags from Valley Forge. The Valley Forge G-Spec Large Nylon 5-foot by 9.6-foot American Flag, for example, is the premium government flag by Valley Forge. This flag is made from Valley Forge’s exclusive Perma-Nyl high-tenacity, industrial strength 70-denier lightweight nylon. For durability, the flag features lock-stitched seams and a heavy canvas duck heading with sturdy brass grommets. Like the cotton flag, this flag features beautifully sewn stripes and embroidered stars. This flag is also made in accordance with the U.S. code Title 4. Order this beautiful flag today for only $76.35, a savings of $over $45 off the list price. An American flag from Valley Forge is more than just a flag; it’s a statement of pride in our country. Since it’s beginnings in 1882, the Valley Forge flag company has remained a family owned and operated business. Valley Forge flags are 100% made in the United States. Valley Forge flags have been flown by the armed forces since World War II and are used as fallen veterans and past U.S. presidents are laid to rest. At the United States Flag Store, we have a great selection of Valley Forge flags, including these nylon flags. Nylon flags offer great durability a nd flyability and are a lower-cost alternative to polyester or cotton flags. The Valley Forge 3-foot by 5-foot American Flag is a great option for outdoor use in areas with low to moderate winds. This flag is made from heavyweight, high-quality Dupont Solarmax nylon fabric that resists fading and reinforced fly ends to prevent fraying. The flag features beautiful construction, including sewn stripes and embroidered stars. For durability, the flag has brass grommets and heavy canvas at the pole end. The flag is also good for indoor. Order one of these beautiful flags today for only $17.25, a savings of over 50% off the list price. Discounts are also available for ordering two or more flags! We also have Valley Forge nylon flags in much larger sizes with customizable options. The Valley Forge 20-foot by 30-foot Sewn Nylon American Flag, for example, is a great choice for a larger nylon flag for outdoor use in areas with low winds. This flag is made from lightweight nylon, resists fading and fraying, and is considered the “all weather U.S. flag.” The flag is beautifully designed with sewn stripes and bright white embroidered stars. Additional options available are adding fly end corners, adding a top header and grommets, and adding a top header and reinforced patches. Order this beautiful flag today for $473.80, a savings of nearly $350 off the list price. Are you looking for a flag that looks great and won’t fade or fray with extreme weather? At the United States Flag Store, we have manufactured our own Super Tough Brand of American Flags to answer your needs. These great flags are 100% made in the United States by the United States Flag Store and aren’t available from any other vendor. The polyester used in these flags is a special high-tech fabric that resists fading or fraying. Read on to learn more about our great selection. 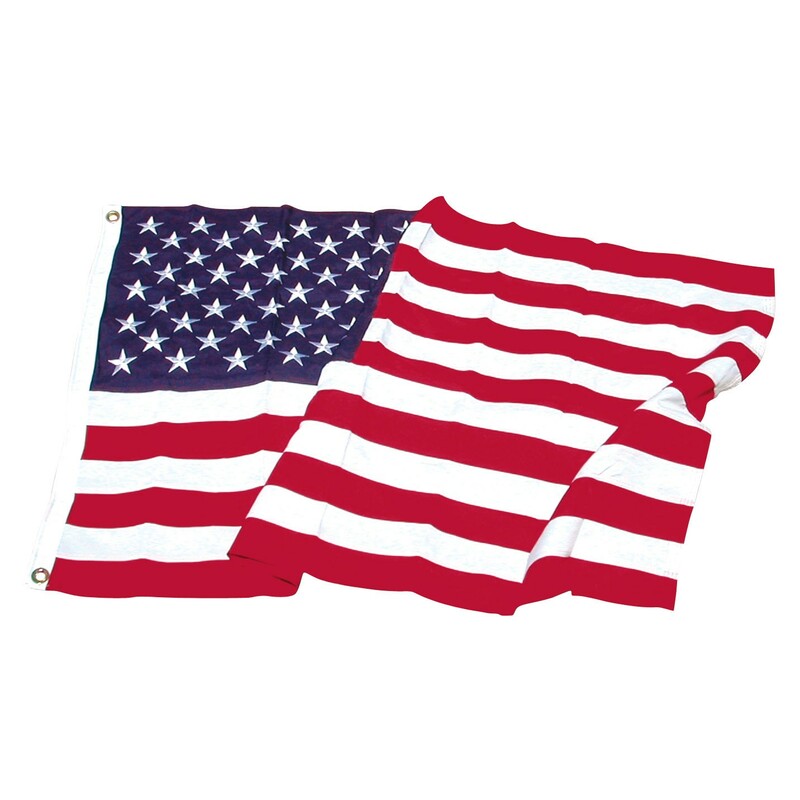 The 3-foot by 5-foot Super Tough Brand Polyester American Flag is the perfect option for customers looking for a durable but economical American flag. This flag is designed to resist fraying even in areas that experience high winds and is the best option for flags that are outdoors 24/7. The flag features embroidered stars and sewn strips for a beautiful and authentic appearance, and a canvas heading and brass grommets for added durability. With five-star ratings from our customers, you can’t go wrong with this flag. Order one today for only $25.70, a savings of over $16 off the list price. If you’re looking for a larger flag with the same durability, the Koralex II Flags from Valley Forge are an excellent option. Koralex II is a spun polyester that is one of the most durable materials for flags available. We also have custom options available for larger flags. The 10-foot by 15-foot Koralex II American Flag from Valley Forge, for example, features beautifully embroidered stars and sewn stripes. With this flag, you can choose to order as is, with fly end corners, with a top header and brass grommets, or with a top header and reinforced patches. This beautiful flag is available for only $189, a savings of nearly 50% off the list price. Many people who want to fly American flags want the look of the traditional cotton flags, but without the fading and fraying. American Flags made from Koralex II is the perfect solution. Koralex II is a polyester material that looks like coarse cotton, but it won’t fade or fray. These flags are loved by our customers, receiving many five-star reviews. They’re also manufactured by Valley Forge, the same company that has been manufacturing American flags for governmental and military use for decades. 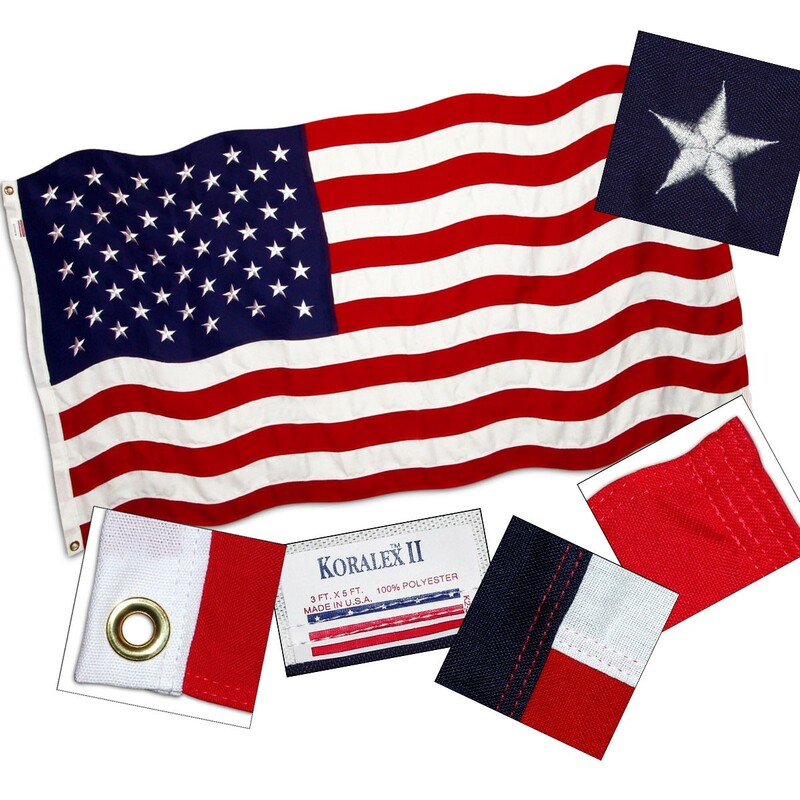 Read on to learn more about our great selection of Koralex II American flags. 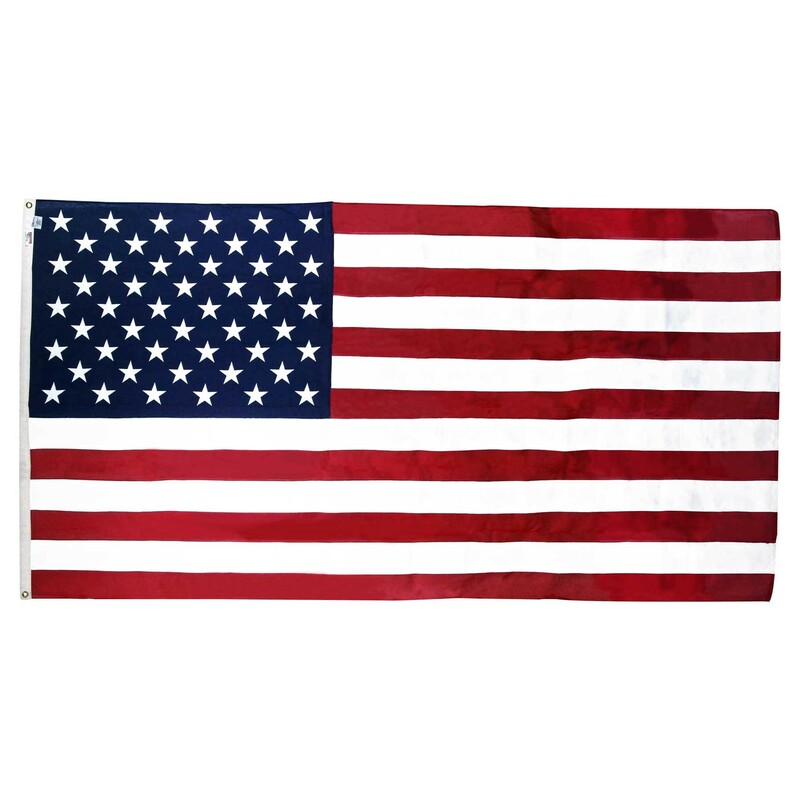 The 3-foot by 5-foot Valley Forge Koralex II 2-Ply Sewn Polyester American Flag is a great option for customers looking for a traditional and durable American flag. Manufactured by Valley Forge, this flag is 100% made in the United States. The Koralex II material is spun polyester, the most durable material available for flags, and it adds life to the flag by resisting fraying and fading, even in areas that experience extreme weather. The flag features a durable nylon header and brass grommets. With a 6-month warranty, you can’t go wrong with this flag. Order one of these great flags today for only $24.95, a savings of over 50% off the list price. We also have Koralex II flags in large sizes with additional options available. The 20-foot by 30-foot Valley Forge Koralex II 2-Ply Sewn Polyester American Flag, has all the great features of the smaller Koralex II flags, with additional customizations. Our larger flags feature beautiful appliqued stars and sewn stripes. Additional options include adding fly end corners, a top roped header with grommets, and a top roped header with reinforced patches. These flags are available at unbeatable prices, too. Our 20-foot by 30-foot flag is $638.60, a savings of over $440 off the list price.